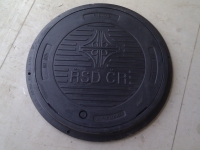 P600B Rovasco plastic manhole cover with RMD CR logo and ZHP lock to cover sewer manholes mainly in the median strip of highways and dual carriageways. . The plastic frame has two recesses for easy cover removal and six holes for anchoring. The lock key is supplied separately. The key for the ZZP and ZHP locks is identical.